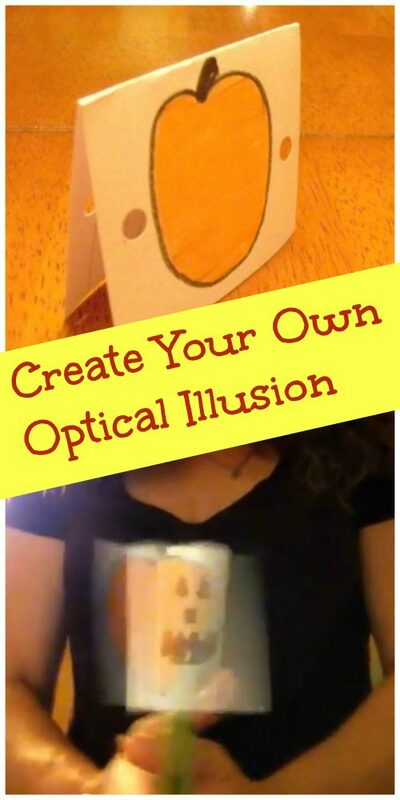 Kids will love this easy Optical Illusion Science Experiment with free printable! There are a number of easy ways to learn with science -- many of them arise from the questions the kids have about things they see happening in the world around them. For fun ideas about how to introduce every day science concepts, try a few of these fun ways to teach kids about science. Other questions are more easily answered with a quick experiment like this one on optial illustions. My kids have always been crazy over the optical illusions they see in books and very intrigued in how it's done. An optical illusion is a visual image that can be perceived differently depending on how you look at it. We say it's a picture that tricks your mind. It really is kind of a trick so we thought we'd do one for Halloween as part of a trick and treat science experiment! If you're using an index card, fold it in half. For the free printable illusions, you'll cut out the paper on the bold lines and fold on the dotted lines. You can see that we bent the card in half to get two equal sections. If you're drawing an illusion, you'll need to decide what picture you'd like to use -- let kids be creative with this! We chose a jack o'lantern for Halloween but you can also do any fun picture that can be drawn in two parts. 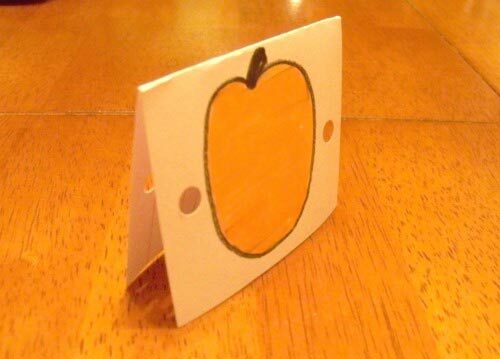 Draw the pumpkin on one of the pieces of paper and on the other, draw the jack o'lanterns face. Tape the index card to the top of the pencil -- we put the tape on the pencil with the sticky side up. You'll need to hold the pencil between the palms of your two hands and move it back and forth quickly to have the illusion appear. Try doing the experiment in front of a mirror so you can easily see the what's happending while also holding the pencil at a comfortable level. 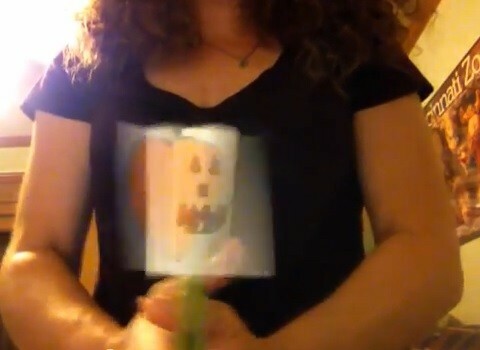 As you can see, the face looks like it appears to be on the pumpkin when you spin the pencil quickly! The more smoothly you can spin the pencil, the better the illusion will appear to those watching. One of the things I really like about optical illusions is that scientists are still studying and testing why we see things the way we do. There have been a few theories about how they work. One of the more recent studies has shown an optical illusion occurs because our brain is trying to understand and make sense of what we see. Sometimes the brain will use past images and experiences to try and understand what the eyes are seeing. In this experiment, the paper is moving so quickly that the brain is receiving information about the second picture as it is still processing the first picture. So, the jack o'lantern face appears to be on the orange pumpkin when the pencil is spun quickly. When you slow down the pencil, your eyes and brain will see the two images independently. It's a great example of "things aren't always what they appear to be"! You can dive deeper into optical illusions with these activities from the American Museum of Natural History. We even have a FREE printable that you can use to create your own optical illusions! 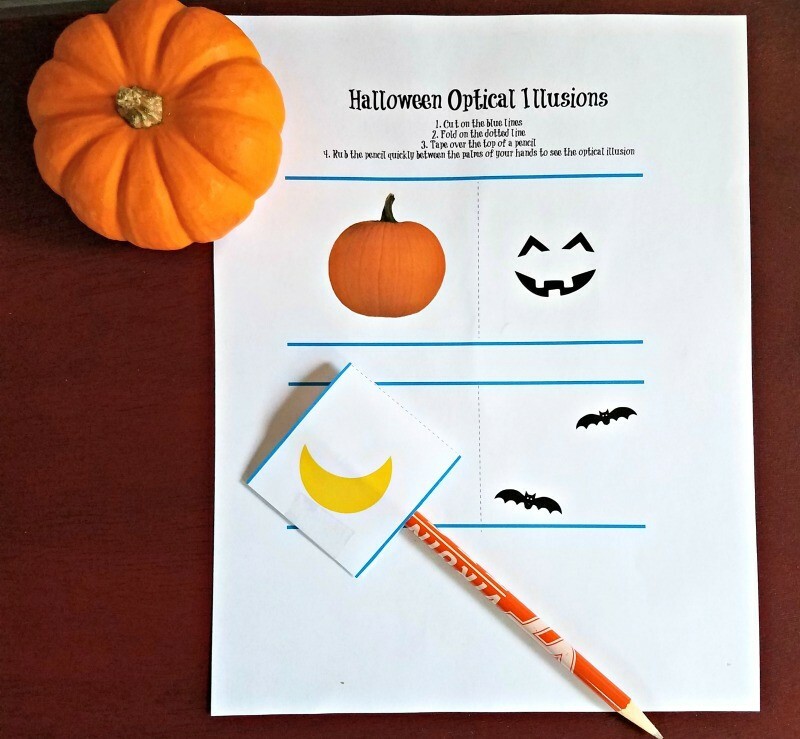 Create a jack o'lantern or watch bats fly around the moon with this Halloween-themed science worksheet for kids. That is so cool! My daughter would love this. Any ideas for other ideas for what to draw on the 2 cards? I remember doing this experiment as a kid. Great learning activity! Thanks for sharing it with us, Jacquie! Very fun! Daughter just read a book with 13 optical illusions in art. Perhaps we should make our own like you did. Thanks for sharing with Afterschool!